This﻿ was a spinoff addon from Kerbal Construction Time containing only the booster recovery code. It was split it off since 0.24 makes recovery of spent stages practical in the stock game. This mod allows funds to be recovered, at a reduced rate, from dropped stages so long as they have parachutes attached (not necessarily deployed). Easy to use, non-intrusive GUI for viewing Recovered and Destroyed Stages. Editor helper to help you figure out just how many parachutes you need. Powered recovery of stages. Land with rockets, instead of just parachutes! Designed to work alongside FMRS! If FMRS is deactivated, SR will handle recovery. If FMRS isn't handling parachute stages or has deferred them to SR, then SR will handle them while FMRS handles controlled stages. With 1.7.1, more advanced support for FMRS. With the new RecoveryController integration you can designate stages to be recovered by StageRecovery, FMRS, auto, or no mods during construction or flight. Now you can be your very own Elon Musk and have your rockets land with their engines! This feature is a work in progress, however, and will be improved in future updates. With that said, if you are having issues with recovery, first try going into the settings and disabling Powered Recovery, then you can report your bugs if they didn't go away. So, what are the requirements for powered recovery? An activated﻿ engine (or multiple), excluding SolidFuel powered engines (engine ISP will be properly averaged). A total Thrust-To-Weight ratio of greater than 1. Even if using parachutes. All engines are averaged together to act as a single engine. All required propellant types are assumed to be the same as the first engine (non-SRB) found. This is designed primarily for stock-alike engines﻿. Mod engines that require strange fuels may have unexpected issues. Powered recovery is made possible by Malkuth, of Mission Controller﻿ Extended. Malkuth graciously offered the MCE powered recovery code to me, which was used as a base for the code implemented here. The chance of burning up should be 100 x 2 x [(srf_speed / DR_Velocity) - 1], which in other words is 2% per 1% that the surface speed is faster than the DR Velocity setting. As an example, if you set the DR_Velocity to 1500, then a 2000 m/s surface speed will have a 67% chance of burning up, rather than 0% at the default setting of 2000 m/s. Adding a heat shield can reduce this﻿ chance by up to 100% (note that the chance of burning up can exceed 100%) based on how much material remains. If 50% of the heat shield material remains, then the chance of burning up reduces by 50%. 100% remaining -> 100% reduction, 10% remaining -> 10% reduction, and so on. As an example, consider a stage going 3200 m/s at the point of "deletion" when SR kicks in. This stage has a 120% chance of burning up, meaning it will always be destroyed if it doesn't have a heatshield. Luckily, it has a heatshield attached that has 80% of the ablator left. This reduces the chance of burning up by 80%, down to 40% (120-80=40), greatly increasing the odds of the stage surviving reentry. 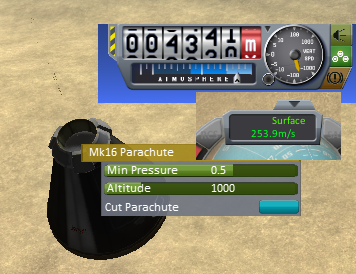 PSA﻿: Set your chutes to open at Min Pressure of 0.5 and activate/stage them with your stages! KSP 1.0 added reentry heating (and parachute breaking) and an increased physics range (now 22.5km). If you drop a stage below ~10km it might hit the ground before you are out of physics range. Setting Min Pressure to 0.5 and activating the chutes will cause them to deploy around 4.5 km at a hopefully low enough speed. Set it higher than 0.5 if﻿ you'll be dropping them at speeds higher than 250 m/s at altitudes around 5km or less so they aren't ripped off. Boldly crashing what no Kerbal has crashed before! CF is a well know source, and people relying on it would be left behind from mainstream! I don’t do Curse. I’ll ask Magico13 to remove it. I already support 2 download locations for more than 170 mods, I dont have time or desire to support a third. On a second though… Perhaps deleting it is a bad idea (sorry for that, I should had though twice before posting). Only two years (2016). The CurseForge goes to KSP 0.24.2 (2014)! @linuxgurugamerI couldn't get the SR button to pop up, and i couldn't get it to save any of my stages. My log said it was missing dependencies Toolbar Controller and Click Through Blocker. Installed those and it works. Not sure if those are supposed to be dependencies or not, but I figured I'd let you know. How do I keep it from "recovering" aircraft & pilot I had parked at KSC during a rocket launch? Is this Pre-Recovery? There's a DistanceOverride setting in the config, but it's -1 and from searching the previous topic, that seems to be more to do with distance from KSC for recovery. Any ideas? Was this just a fluke? Heh. I'm still sandboxing while I learn some new mods/tricks, so maybe I'll try to re-create that setup and see if it keeps happening. I think the plane was parked at/near the monolith, but I routinely leave aircraft at the hangar/taxiways. Aw, heck. It happened again while doing some aicraft ops in the water East of KSC. My spotter plane got "recovered" when the main rescue craft flew back to KSC. Turns out I had forgotten to de-select pre-recovery. Will try to re-enact that and see if it makes a difference. Thanks for all the outstanding work you have done adopting orphaned and abandoned mods! I know you are currently maintaining a whole slew of mods and am not sure if you plan on making any changes to the mods currently under your care. If so, would you be willing to consider adjusting the settings for StageRecovery? Currently any changes to the settings are applied globally and affect all saves in a given KSP install. It would really be beneficial, in my opinion, to be able to change the settings on a per save basis. For example, in a sandbox save I click the StageRecovery button in the KSC scene to open the settings menu and uncheck "Mod Enabled" to disable the mod since it is not really relevant in the sandbox. Currently, this also disables StageRecovery in my career mode save, where I do want it to remain active so I have to remember to re-enable the mod. I would consider this a bug, not a feature. And I do fix bugs. That would be fantastic, thanks! And Happy Thanksgiving! Should be out by Sunday. Going for MIT is probably the safer option, but had you secure permissions from magico13, rem02, phwoelfel, fommil and Kerbas-ad-astra? StageRecovery was originally released under the GPL3, and you need (registered and trackable) permissions from every committer in order to relicense it - under the sanction of having the GPL revoked for you - rendering your whole worked unlicensed, unless an additional license was granted to you. It's unfortunate in this case, but you do not have the rights to relicense other people's work - only the Copyright Owner(s) of the work can do it, and ownership is the one thing that GPL does not grant to you. Thank you. It was not clear on the repo. If you allow me, may I advice to commit on the repo a screenshot and a link to the post with the permission? Just in case - better safe than sorry! 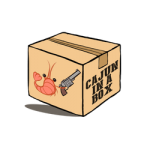 @linuxgurugamer I thought I'd let you know that the in game AVC download link is still pointing at a forum page that no longer exists.